Paul Begala, a CNN political contributor and former adviser to President Bill Clinton, on Thursday chided the New York Times for noting what House Speaker Nancy Pelosi (D., Calif.) was wearing when she entered the House chamber to accept the speaker's gavel. In a tweet that has since been deleted, the Times wrote, "Nancy Pelosi, wearing a hot pink dress, ascended to the marble dais in the center of the House chamber to accept the wooden gavel." 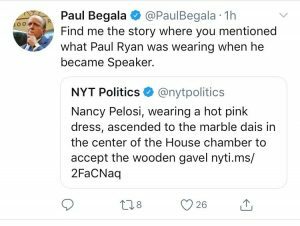 Begala criticized the tweet by responding, "Find me the story where you mentioned what Paul Ryan was wearing when he became Speaker." 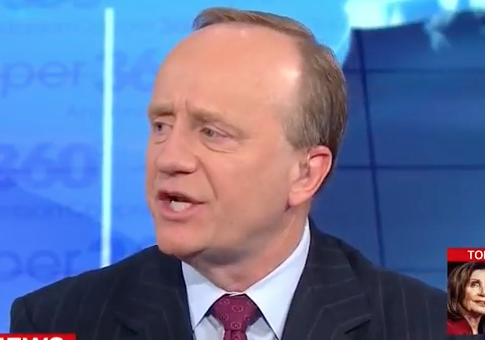 Begala has been a long-time supporter of Pelosi and praised her earlier on Thursday after Democrats voted her speaker, saying that she is a "remarkable woman." "Such great news. And such a tribute to @TeamPelosi – a remarkable woman – and to the millions of remarkable women and men who took back the House by knocking doors, registering voters, making phone calls, donating, and voting," Begala tweeted. "Democracy at work is a beautiful thing." This entry was posted in Politics and tagged Nancy Pelosi, New York Times, Paul Begala, Paul Ryan. Bookmark the permalink.